Cut the chicken breasts in half and open them up. Sprinkle them with grated mozzarella and then close them and cut in half. Dip the chicken in flour, beaten egg, and panko breadcrumbs, and fry them for a few minutes in oil until golden brown. 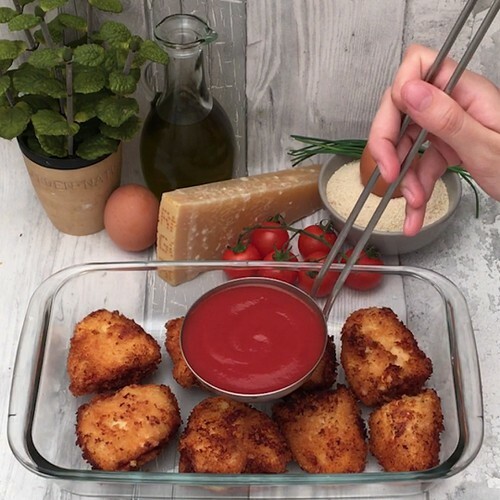 Place the chicken nuggets in an oven proof dish and top with tomato sauce. Add grated mozzarella and parmesan on top of the dish and bake for 20 minutes at 180 °C. Garnish with chopped chives and enjoy with salad on the side.